Hosted by the very talented Sharon! Pink and Cream with lots of Bling! that I have created for this fun challenge! work with this pretty colour combination! loves to play pretty princess dress up! I had lots of fun using die cuts, pretty lace, pearls and flowers! 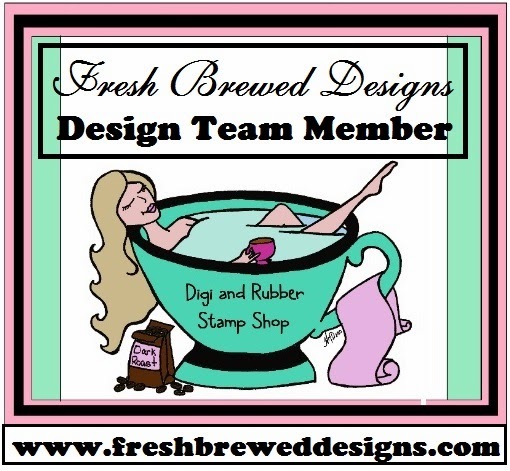 Fresh Brewed Designs, "Happy Birthday Challenge"
It's so very good to be back creating cards and posting again! I have missed playing and creating so much! catch up on the cards you will need for upcoming Birthdays! for every child, teenager or adult on your list! You can browse through her shop here. to the frosting and sprinkle container! I have had the pleasure of creating a card! This card is for the Fussy and Fancy Challenge that I am hosting! I colored this Sassy Birthday Girl with copics. and from there I went a little crazy with the flowers! up adding some translucent confetti to cover it up! Fussy and Fancy Challenge Blog! I hope to create a lot more cards in the very near future! I really do find it so very relaxing! Good morning and welcome to the Digis for Debbie Fundraiser Blog Hop. Recently, we learned that Mrs. Debbie Lynch, the beautiful and loving mother of Heather Dennis, owner of Fresh Brewed Designs, was diagnosed with a rare form of uterine cancer. As most of you may know, cancer related medical costs can be quite expensive, and Mrs. Debbie currently has no medical insurance, which makes the cost significantly higher. Therefore, we have decided to help raise enough money to cover these medical expenses, as well as aftercare expenses, by creating a digi shop. All the proceeds of the Digis for Debbie Fundraiser Shop and the Fresh Brewed Designs Store will go directly to Mrs. Debbie to fund her lifesaving surgery and the aftercare necessary to bring her back to wellness. Furthermore, Heather has created a Give Forward account to assist her mother. and/or the Give Forward Account. For those of you who are not able to contribute monetarily, we would love for you to add Mrs. Debbie to your prayer list. If there is one thing we know, prayers can work miracles that money cannot and healing and wellness is what we are praying to receive. Fussy and Fancy DT Call and a New Challenge hosted by me! I sure am looking forward to this weekend! Fussy and Fancy DT Call applicants to review! becoming a Fussy and Fancy Girl! Go here to read more details! very familiar with just about every flower! She loved this card with the pretty Spiderwort Sprite! are all from my stash. From Marianne Design - Creatable Die Double Frame Set. You receive four dies, two scalloped circle frames and two flourishes. Fussy and Fancy Girls have created! Then I hope that you can play along with us! or the very generous prize that Mitzi at Aurora Wings is offering! and it was so much fun! The children loved it! Happy Birthday with some sprinkles on top!! We can always use another "Boy or masculine" card! Who has a friend who loves to shop for shoes? I know more than a few! card for all of your shoe shopping friends! admire the most gorgeous pair of shoes! This isn't the only new digi being released today!